Roman markets : how markets in Rome can be fun things to do. Roman markets: how markets in Rome can be fun things to do. Shopping in Rome, Italy, can be tedious for kids. 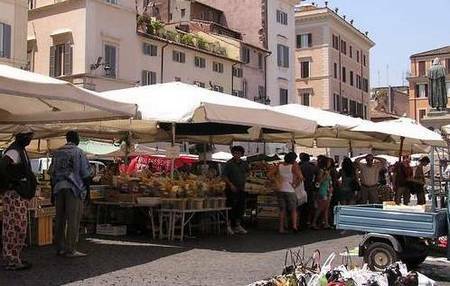 Here's how to make Roman markets one of the fun things to do in Rome for kids and adults alike. Visiting Roman markets is amongst the best things to do in Rome to experience all the chaotic, vivid life the city has to offer. Go there preparing to be entertained. Campo dei Fiori market, Rome, in November. You're likely to come across small street markets in Rome just wandering round the city, but if you want to hunt out some of the bigger ones these are our favourites. 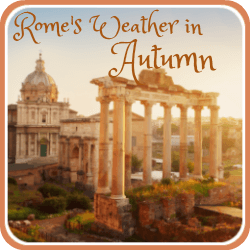 Most are close to the big Rome tourist attractions so plan to combine a sightseeing tour to please adults followed by a market visit, which kids and adults alike will love. The street markets in Rome that take place throughout the year are also fun to visit as they normally sell a good variety of local produce, handicrafts and clothes. If you're planning a trip to Rome in the winter months for example, you'll want to look at the daily Christmas Roman markets held on the Piazza Navona to stock up on festive Italian specialities. One word of warning - and this would go for any busy market anywhere in the world - be careful of your purse or wallet. Pickpockets know that the more famous and therefore crowded markets in Rome are places where tourists are to be found. That said, don't let it deter you from enjoying yourself - just be aware. 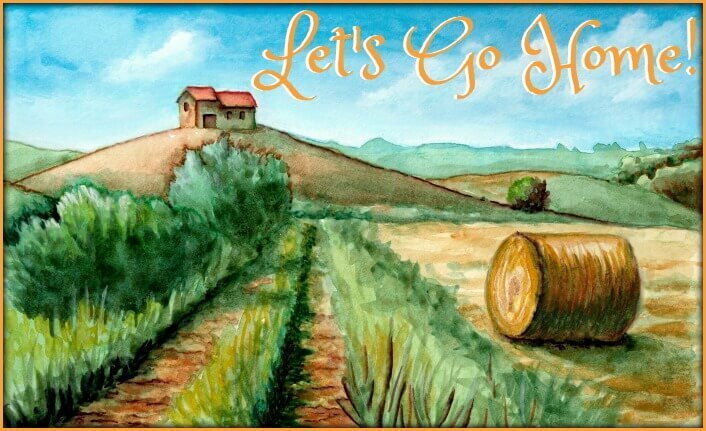 So go, soak up the atmosphere, wander, wonder, haggle, and see for yourself how markets can make Rome for kids and adults alike a place of huge enjoyment and fun. Our very favourite of all the markets in Rome. You'll need to be up early to see it in full swing; in a great lesson on how to keep cool in Rome's heat it starts at 7 a.m. and is all over by 2 p.m. at the latest. The oldest surviving of Roman markets, it's an amazing experience for the colours and the 'buzz' alone. Mainly a fruit, vegetable, spices and fish market, it's one of the best places to go shopping in Rome, Ialy, if you want to feel part of Roman life. Italians here have made displays of fresh fruit and vegetables into an art form, and kids will love the weird looking fish on sale. There are also stalls selling clothing, in particular t-shirts, bags, and some nice beaded jewellery. Our tip : One of the nicest things to do in Rome is to go to the Campo early and visit 'Il Forno' bread shop at the top of the square. Buy fresh pastries to eat while you're walking around. When you've had enough of the market, there's a good choice of cafés to sit and watch the bustle carrying on while you sip a cappuccino and the kids enjoy a delicious Italian ice cream. This page about food in Rome for kids gives details of how to find the bakery. N.B. this market does not take place on a Sunday. Actually, we're not sure what this is really called, it's just one of those open air markets you'll come across when you're wandering round wondering what to do in Rome. Cross over the Ponte Sant'Angelo and immediately in front of the castle turn right along the road above the river. If you need to go shopping in Rome, Italy, for souvenirs to buy this is ideal. It's one of those charming little street markets in Rome which has lots of small trinkets - kids will have a lovely time picking over them for friends back home. It also sells a good range of tee-shirts, homeware including tablecloths, carvings and pottery, and some lovely handmade jewellery which teenage and young adult girls will adore - not to mention the adult women in the family! Our tip : After you've wandered down this lovely tree-lined street market and your kids have spent up, treat them to some time on Rome's beach which is just a few steps away, although chances are you won't see it unless you know where to look. It's a great place in Rome for kids to cool off in the heat of Rome in the summer. You'll either love this most famous of all the large markets in Rome or you'll hate it. It's a 'mercato delle pulci' - flea market - and has taken place every Sunday morning since the end of World War II, on and around the Viale di Trastevere in the Trastevere district. 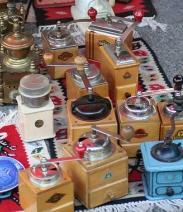 Coffee grinders for sale at Porta Portese market. Stallholders come here from all over Italy to sell an assortment of regional goods. There's a buzzy atmosphere and a lot of souvenirs of all sorts on sale which kids will love, including cheap jewellery, watches, purses, and general tourist bric-a-brac as well as things to keep adults happy - clothing, shoes, 'designer' bags and food. For those living in Italy there are household goods, spare car parts, second-hand clothes, kitchen equipment - even budgies! Prices range from €1 for a keyring to hundreds for furniture. Along the tree-lined Via Ippolito Nievo are the Russian street traders selling everything Russian, from caviar to religious pictures and lace. In terms of a bargain, this is one of the best places to test your haggling skills in Rome; for kids it may be a bit more daunting - so give them some help! Our tip : If you want to buy, offer half the marked price at first and walk away if it's rejected. Return a short while later and try again - you'd be surprised at how suddenly prices can fall! Find this market in the Via della Fontanella di Borghese (close to the Ponte Cavour - not in the Borghese Park) Monday to Saturday between 7 a.m. and 1 p.m. This is the best of all Roman markets if you love books and prints - probably more interesting to adults than kids. 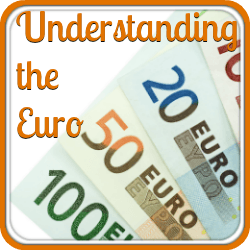 If you've visited the book stalls of the left bank in Paris you'll know what to expect here. 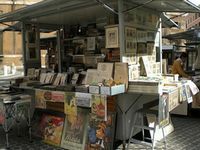 There are dozens of kiosks filled to the brim with old books, magazines, engravings and prints of Rome. This isn't a tourist trap - the book kiosks near Termini station do that job - and you'll be expected to bargain over the price. The quality varies from stall to stall but if you love books or old prints, you'll love this. Our tip : Quite close by you'll find the best Pizzeria in Rome. Browse in the morning, aim for the Pizzeria Leoncino for lunch. Have a look at this page of food for kids in Rome for details. 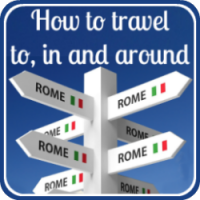 Want to know what's best to buy in Rome as souvenirs? Taking kids who are mad about Italian football? 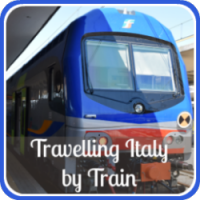 Looking for things to do in Rome for kids?